While I don’t think we need science heroes for a functioning democracy, if writers want to distort the past for their own purposes—just as Hollywood distorts the laws of physics for its purposes—so be it. Just admit what you are doing. Recently, I found myself in a small town in Arizona with little to do, so I stopped by the library bookshop to see if there was anything interesting for sale. Given the demographics, I was not surprised to see shelves packed with used romance novels and biographies of famous people—mostly celebrities and royalty along with a smattering of politicians. 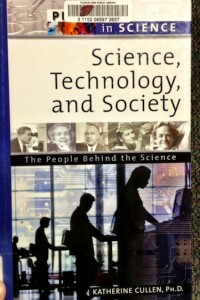 I was at first surprised to see a book titled Science, Technology, and Society. 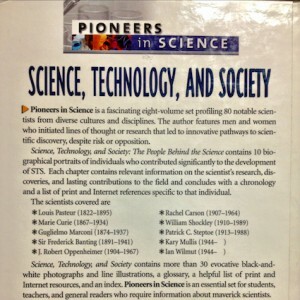 The People Behind the Science amongst the other biographies. 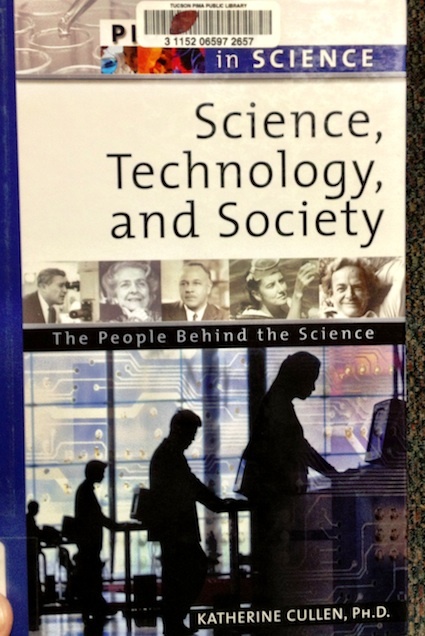 Cullen’s book is less about “people behind the science” than the heroes who did the science. 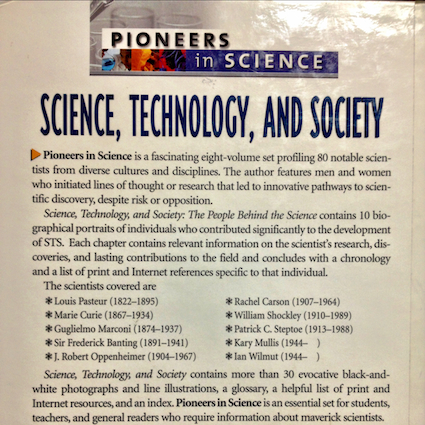 Science, Technology, and Society is a grab bag of heroes who didn’t fit into her other books—organized around chemistry, biology, physics, earth sciences, weather and climate, marine science—than it is a study of science, technology, and society. Cullen’s book is a grab bag of science heroes. Elly over at Medieval Robots revels in how digital humanities are making medieval and early modern material available to broader audiences (see her “How Early Modern Animal Jetpacks Went Viral). I too am delighted to see digital resources making so much material available both for scholarly use and for the interested audience. Recently the Vatican has started making its collection of Latin manuscripts available (maybe they’ve been there for a long time, but I just learned of them): Manoscritti digitalizzati. Let’s hope they continue adding to the few hundred that are already posted. 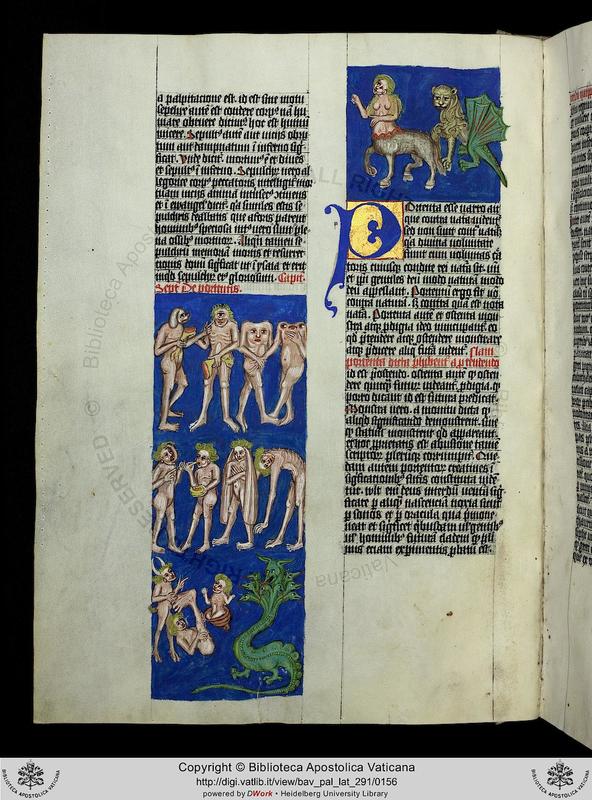 Killing a few minutes looking through these manuscripts I came across a great copy of Rabanus Maurus’s encyclopeia, “De rerum naturis” from 1425 (Pal. lat. 291). There are wonderful illuminations throughout. A few caught my attention. 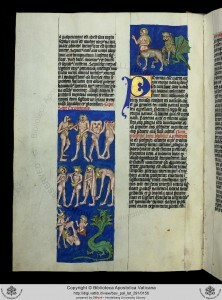 The chapter on portents opens with this great illustration of different prodigious creatures—a dog-headed person, a cyclops, monopod a Sciopod (thanks to Elly at Medieval Robots for reminding me what these creatures are called), headless people with faces in their chests—all pretty standard from the encyclopedia tradition, especially Pliny’s Historia naturalis (for a nice collection of monstrous race images, see Rensodionigi’s Flickr collection). 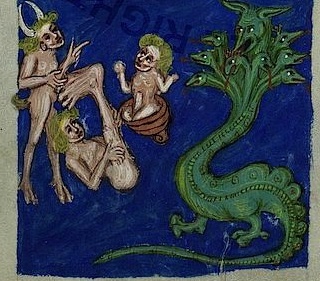 A standard set of prodigious creatures found in many encyclopedias (Pal. lat. 291, fol. 75v). An aroused prodigious creature (detail Pal. lat. 291, fol. 75v). A unicorn skewers and elephant; a canine-looking creature with a beaver’s tale seems to be eating itself while another is finishing off a human hand, and the legs of a bird-like creature are sticking out of an alligator (Pal. lat. 291, fol. 86v). The zodiac (Pal. lat. 291, fol. 109v). Whether you are a scholar doing research or an interested person looking for something amusing, there’s no end to the fun you can have looking through these manuscripts. 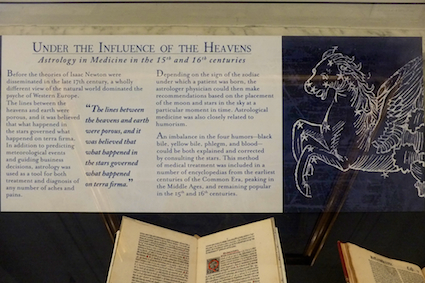 There is a nice little exhibition on astrology and medicine at College of Physicians of Philadelphia (CPP): “Under the Influence of The Heavens: Astrology in Medicine in the 15th and 16th Centuries.” They selected about a dozen books from their rich and often unexplored collection of early printed books. One case displays some incunabula ranging from relatively well known books. 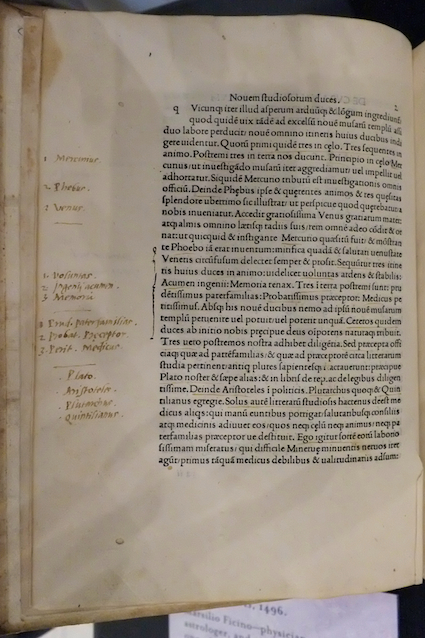 An annotated copy of Marsilio Ficino’s De vita libri tres (1496). Giovanni Abiosi, Dialogus in astrologiae defensionem (1494). 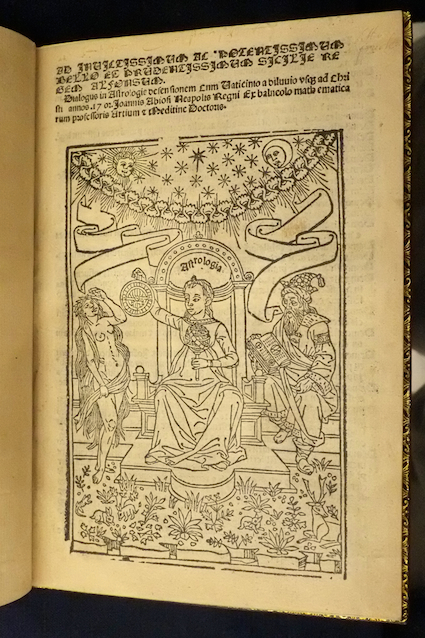 Gregor Reisch’s Margarita philosophica (1517). A couple of these later books have elaborate volvelles—sort of paper instruments with moveable wheels that allowed a reader to carry out various operations. 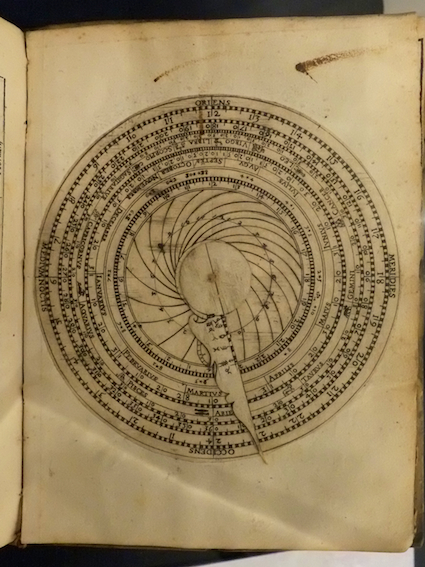 The elaborate volvelles in Giovanni Paduani’s Liberalium artium professoris Viridarium Mathematicorum (1563). These few books don’t begin to scratch the surface of the medico-astrological books at the CPP. Fortunately, many of the early works, at least through the sixteenth century, were identified by Alexandra Waleko, a recent history major Haverford College who interned at the CPP a couple summers ago, thanks to support from the Hurford Center for the Arts and Humanities at Haverford. 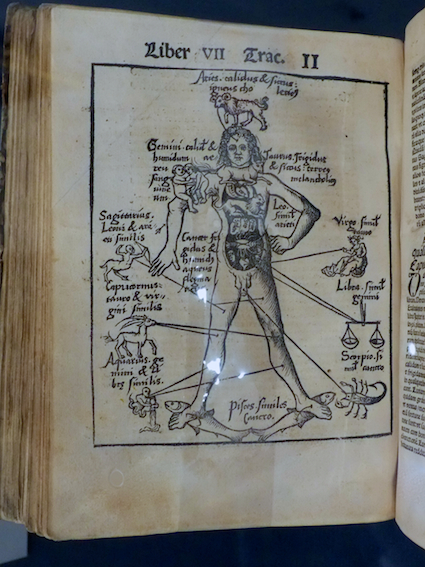 Alex Waleko helped catalog the College of Physician’s books on medical astrology. 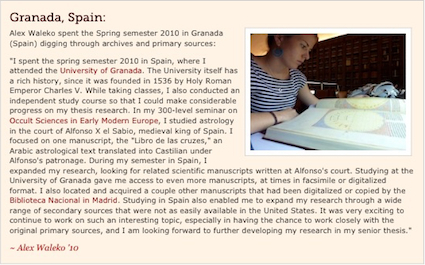 After spending a semester in Granada studying abroad and conducting research in the archives for her thesis, she returned and spent the summer digging through the collection at the CPP looking for early books on astrology and medicine. These provided much of the foundation for her interesting thesis on how astrology served the political agenda of King Alfonso X. If you are in Philadelphia you should stop by the CPP and look at the exhibit. But such efforts were not limited to quack medicines. 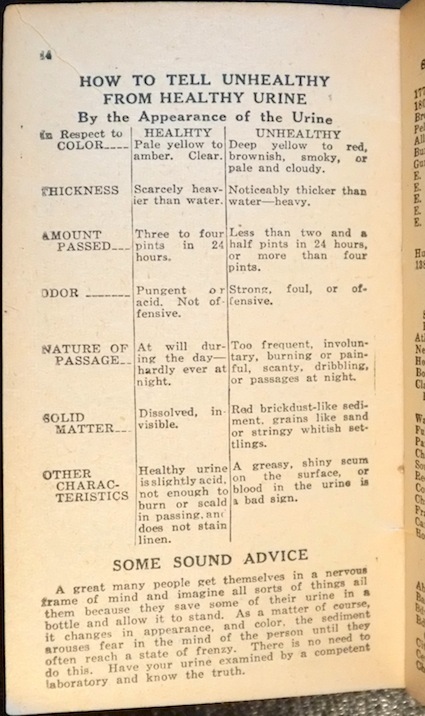 The pamphlet of useful knowledge appears to have been a common advertising mechanism in the early 20th century. The “New York Brooklyn Manhattan and Bronx Guide. A Book of Knowledge and Information” from 1937. In this case, a doctor (physician?) by the name of Wm. 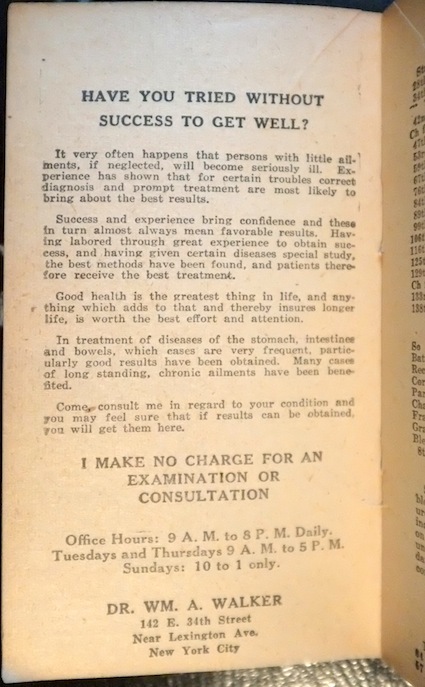 A. Walker used this pamphlet to advertise his practice. It is full of frightening and pathologizing rhetoric and warns people against trying to heal themselves. The pamphlet also serves to establish his own expertise through a combination of esoteric knowledge and long experience. Dr. Walker celebrates his own experience and offers initial consultations free of charge. One diagnostic tool that would bring almost anybody to Dr. Walker now and then was the physician’s old standby, urinalysis: Is your urine the wrong color? to thick? to much or too little? stinky? too frequent? clouded with dissolved stuff? greasy or covered with a shiny scum? All these are bad signs. How to tell unhealthy from healthy urine, a primer. 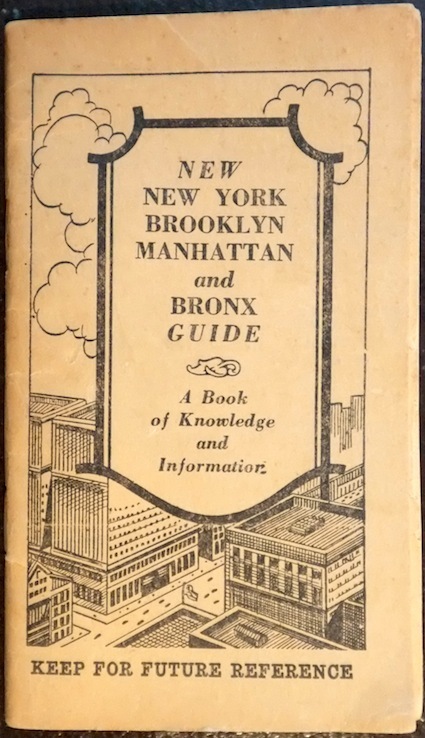 In addition to the medical advice, Dr. Walker’s pamphlet included subway stops, train times, addresses of important and interesting sights in the city, and other useful information. While looking box of material I stumbled back across some microfilm I had ordered from the Biblioteka Jagiellońska in Kraków (If you have any interest in early modern science, this is a great library, which, I am happy to see, has started a digital library). What caught my eye were the stamps on the packages, three of which were artistic depictions of zodiacal signs. 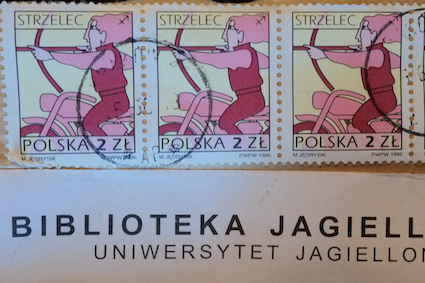 Sagittarius riding a motorcycle on the 2 złoty Polish postage stamp. 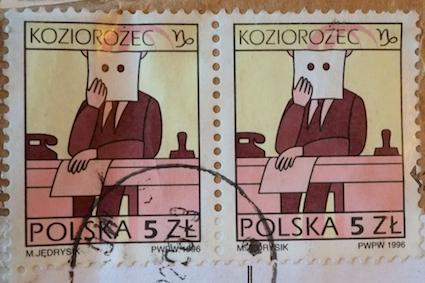 Capricorn the bureaucrat sits at a desk on the 5 złoty Polish postage stamp. 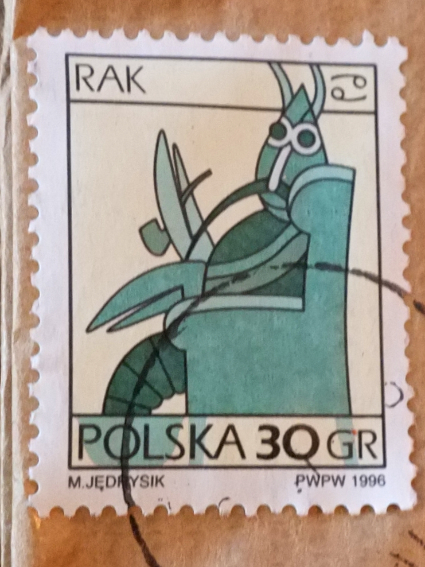 A pipe-smoking crab represents Cancer on the 30 groszy Polish postage stamp. 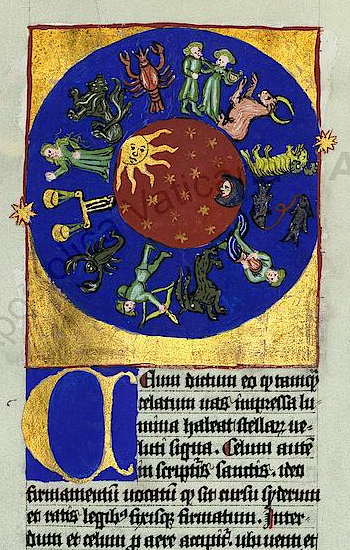 It would be interesting to know how they chose to assign which zodiacal sign to particular denominations. The full set of stamps are here. Stamps have often been a mechanism for celebrating a country’s scientific and technological achievements. For a nice exhibition, see “Sci-Philately. A Selective History of Science on Stamps.” Recently, a graphic designer from London put together a set of stamps highlighting British Inventions. We might wonder how he chose these particular inventions. 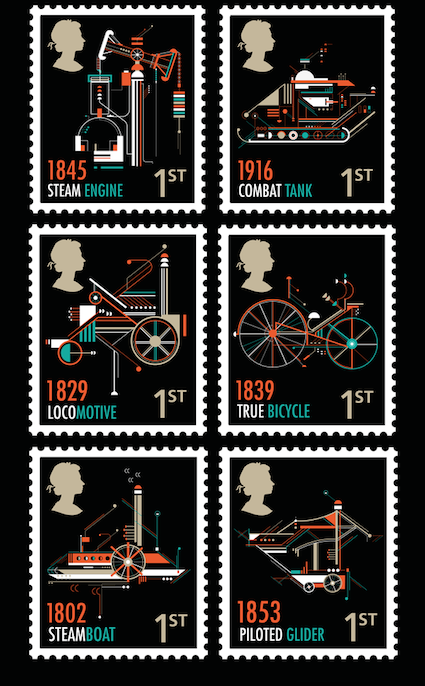 Petros Afshar’s stamps highlight British inventions. Stamps, like currency, commemorate and emphasize a country’s achievements. It is no surprise, then, to see Copernicus on a number of Polish stamps or Brahe on Danish stamps or Galileo on Italian stamps. The signs of the zodiac don’t seem particularly scientific these days. While they have been used to mark calendrical periods and divide the ecliptic, it has been some time since those were the dominate cultural associations between the signs and systems of knowledge. I suspect most people today associate Aries, Taurus, Gemini, Cancer, etc. first and foremost with astrology. And while astrology was once an important science, it no longer enjoys that same status and is often dismissed even as a worthy subject of historical study (see Thony’s summary of a typical debate or my previous thoughts). So why are signs of the zodiac on these recent Polish stamps? What message do those stamps convey? Whose interests do they advance and how?